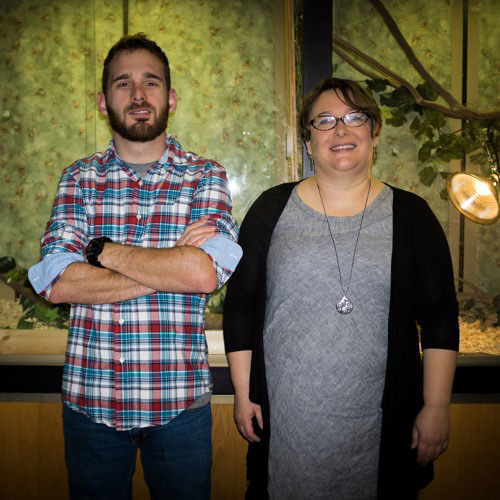 Dr. Jennifer Geib, assistant professor in the Department of Biology, and second-year student Gary Pandolfi discuss Appalachian State University’s Master of Science in biology. This program is housed in the College of Arts Sciences' Department of Biology. Dr. Jennifer Geib: I am Jennifer Geib. I am an assistant professor here in the Department of Biology. We are talking about the MS Program in Biology. I work with the Ecology and Evolutionary track for the master’s program as well as anyone who is interested on education in biology at the master’s level. So people who are thinking about teaching at a community college in biology. Gary Pandolfi: I’m Gary Pandolfi and I’m a current second year student here at Appalachian State in the master’s of biology program specifically. Biology, Ecology and Evolutionary Biology is the degree name. My specific focus of my thesis is on freshwater mussels. I am a freshwater biologist. JG: So my ecology research is focused on plant pollinator interactions. I work with primarily native pollinators like bumblebees and plants that typically occur at high elevation ecosystems. My research is very different from Gary’s in the systems that I work with, but our research is united by the theme of ecology. GP: My research more specifically focuses on the effects humans have on the environment such as forest clearing and forest removal for things like Wal-Mart, shopping centers and housing developments. The infiltration rate of water in the streams goes up quite a bit if you pave over all the forest cover. I’m interested in how that affects federally endangered mussel here in Western North Carolina. I don’t work directly with Dr. Geib; however, we are friends and are on a first name basis as well as all of the other biology professors and graduate students here. It seems to be a very close niche community. The advisor I do work for, Dr. Mike Gangloff, we are quite close and we have built an excellent relationship over the years. It’s a small community, but it’s a lot like a family, if you will. JG: Appalachian is a casual and relaxed environment. Really all student and faculty call each other by their first names and socialize together. With my own students I am really aware of what is going on in their personal lives. I think it is a really congenial atmosphere. GP: I chose to obtain my master’s in biology from Appalachian State because of the close niche community. Like I said earlier it is easy to collaborate with other professors if they have some equipment or knowledge you do not directly have then you can always run down the hall or send them a quick email. JG: I think it is really important to know that despite the fact that we have this really small department and relaxed atmosphere, the research that faculty and students are doing here is very high quality work. GP: I do think we produce some really great work. JG: We bring in a lot of grant funding from national institutions that support our research here. Another thing that is really important for students to know is that their research -- there is a lot of internal funding that Appalachian State provides to graduate students. They can apply for Office of Student research grants every semester that are here to support their own graduate work. Appalachian provides a lot of support not only through research funding, but also through travel if they do want to go to conferences. I really want students to know that entering a master’s program, that is a thesis based master’s, is not the same as what you do as an undergraduate career. In a master’s program that is thesis based, the goal is to produce new knowledge in that area. That is the end goal of that program to not only produce that new knowledge, but to be able to write about and share that knowledge with the scientific community. GP: In my case being a graduate student currently or finishing up currently, I was able to feel like I obtained a lot more knowledge out of a graduate degree. I was down in the weeds in my specific field focusing on that and collaborating with other scientists and institutions as well as state and federal biologist. JG: For ecology I think Appalachian State is an amazing place to be if you consider the species diversity of this location -- for herpetologist, for example, the greatest number of salamanders in the entire country, the greatest diversity are here. GP: We are at the corner of a couple different eco-regions and we are on that southern end of the Appalachian Mountains Just a few hours to the east, you can be down in the Piedmont or the coastal plains of North Carolina. A little ways south you can be in the coastal region further south as well. The salamander diversity is a bio hot spot here. JG: I would say if you are interested in coming to Appalachian, most faculty have research web pages for their lab or you can see who the students are that are working with them or what kind of projects they are doing. It’s a great way to see what work in a master's program here would really be like. The College of Arts and Sciences is home to 16 academic departments, two stand-alone academic programs, two centers and one residential college. These units span the humanities and the social, mathematical and natural sciences. The College of Arts and Sciences aims to develop a distinctive identity built upon our university's strengths, traditions and unique location. Our values lie not only in service to the university and local community, but through inspiring, training, educating and sustaining the development of our students as global citizens. There are approximately 5,850 student majors in the college. As the college is also largely responsible for implementing Appalachian's general education curriculum, it is heavily involved in the education of all students at the university, including those pursuing majors in other colleges. The Master of Science in Biology program prepares students for competitive careers and continued training in biology. This includes the scientific skills for environmental, biomedical and educational fields and with foundational training for further education at the doctoral and professional levels.